Day 232: Sometimes You Gotta Slow Down . . .
Springtime is probably the favorite season around here. The trouble is that for the last few years springtime has been interrupted (rather rudely) by summer. Temperatures in the 90’s in April is no way to ‘enjoy’ spring. Fortunately, this year has given us a pause for celebration. Yes, we’ve had some days of heat–but you expect that living in Texas–but we’ve been blessed with some cool fronts that have been coming through lowering temperatures to spring-like degrees! Today was one of those days. A very cool start to the morning–gave way to an amazing day of full sunshine, a nice breeze, no humidity and virtually no bugs! If it got above 74 degrees (F) we’d be surprised and quite frankly, we could care less. When you can sit on the deck for the better part of the day, listening to music and enjoying conversation. Well, it’s really tough to beat – especially after the week that it has been. Last night, Sam and Elaine came into town . . . Elaine is presiding over a friend’s wedding tonight and they needed a place to crash for the weekend. Elaine is the youngest daughter of fellow wine lovers and travelers, P & L . . . we consider their family like our family, so if they need a place . . . we are ready to host! For all of us, the day was lazy – but relaxing, and relaxing – but just enough things to keep us occupied! A little yard work, a little television, a little reading, a little nap – they all played a part on a beautiful Saturday in San Marcos – which was of course followed by a nice evening on the deck – with finally . . . a fire in the pit! Since we were sitting outside and enjoying a beautiful day, we pulled a really, really nice white wine – yes, that’s right Kathryn – and we automatically thought of you, a White Wine!! Lafage Cote Est Catalan is a delightful white wine gem from the Roussillon wine region of southwestern France. The wine’s official appellation is Vin de Pays des Cotes Catalanes. Deep in this Catalan region of southwestern France, Domaine Lafage blends juicy, aromatic wines that deliver the rare combination of distinctiveness and affordability. Although only in his thirties, Jean-Marc Lafage already has almost 15 years of world-class winemaking to his credit. 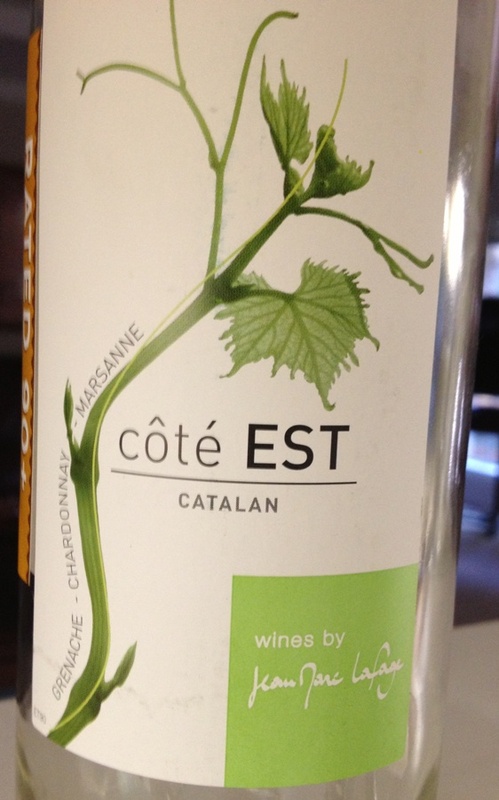 Lafage Cote Est Catalan is an unoaked blend of 50% Grenache, 30% Chardonnay and 20% Marsanne. Super crisp and tank-fermented, this racy white is bursting with citrus, white flowers and minerals. Juicy on the palate, dry but ripe with good apricot and yellow peach fruit character. It is long and flavorful on the finish. Pure and simple this wine rocks! We enjoyed it on the deck – by itself, but it could easily have made chicken or fish or grilled veggies taste even better. Priced under $12 a bottle – and available at H-E-B . . . you can afford to buy 6 or 12 of these gems and save them for your friends. We couldn’t stop raving about how good this wine tasted. It’s a white wine . . . that because of this blog – we’ll enjoy many more times (Leah, yes another one for the “do-over” list). Speaking of enjoying . . . we hope that you got outside today – wherever you are. And, whether it was raining, snowing, windy or sunny, there’s something special about April. The rains last week-though sparse-have paid huge dividends in greenery around town . . . and when things are green in the spring, you just feel better. We also hope that you’ll enjoy your favorite wine responsibly and as always, please recycle whenever possible. Categories: Uncategorized | Tags: Catalan region of southwestern France, Domaine Lafage, Lafage Cote Est Catalan, Roussillon wine region of southwestern France, Team Whitaker, Vin de Pays des Cotes Catalanes | Permalink.